Imagine you and a friend, in Japan, watching Australia v Wales at the world cup! You’ve got the chance to be there and it’s super easy to enter. Purchase any Yupo* product between 1 April to 30 June 2019 to the value of $1000 ex gst (or more) and you’ll automatically go into the draw to WIN. Major prize: includes airfares for two people, 5 night’s accommodation plus tickets to the match which is taking place on 29 September 2019. Minor prizes: we love giving away free stuff, so it doesn’t end there! We have fortnightly prizes you can win too. Purchase a mill pack or any roll product in the Yupo* range and you’ll automatically be entered into the draw to win some rugby merchandise. Winners of the fortnightly minor prizes and the major prize draw will be published here. *Yupo range available include Offset, Offset Extra, Rapid Dry, Octopus Offset Blockout, Blue, Blue Backlit Indigo, Octopus Blue, Octopus Laser, Octopus Aqueous Inkjet WKJ250, Octopus Eco Solvent WKE250, Octopus UV Inkjet XAD1069, Blockout PP Film UV XAA1085. 2. The promotion period begins at 1:00am (AEST) on 1st April 2019 and ends at 11:59pm (AEST) on 30th June 2019. • Agree to the Terms and Conditions. Employees of Ball & Doggett and associated companies and their immediate families and any agencies associated with this promotion are excluded from entry. 4. Yupo product range eligible for this competition include Yupo Offset, Yupo Offset Extra, Yupo Rapid Dry, Yupo Octopus Offset Blockout, Yupo Blue, Yupo Blue Backlit Indigo, Yupo Octopus Blue, Yupo Octopus, Laser, Yupo Octopus Aqueous Inkjet WKJ250, Yupo Octopus Eco, Solvent WKE250, Yupo Octopus UV Inkjet XAD1069, Yupo Blockout, PP Film UV XAA1085. 5. To enter the Major Prize Draw, eligible entrants must spend a minimum of $1000 (excluding GST) to receive one ticket into the Major Prize Draw. $1000 for one entries, $2000 for two entries, $3000 for three entries, $4000 for four entries, $5000 for five entries, $6000 for six entries, $7000 for seven entries and so on (all excluding gst). of orders that can be submitted by the purchaser. Late, incomplete, defaced or corrupt entries will not be accepted. 6. The Major Prize Draw will take place on 5th July 2019 at 12:00pm (AEST) at the office of Ball & Doggett, 6 Reconciliation Rise, Pemulwuy, NSW. 2145. Prize winners name will be announced on the www.ballanddoggett.com.au website by 10th July, 2019 and the winner advised via email and phone. Promoter may draw additional reserve entries and record them in order in case an invalid entry or ineligible entrant is drawn. 7. Major Prize Draw. There is one major prize to be won. The first eligible entry drawn and able to accept the prize as detailed will be awarded the prize: a trip for 2 people to Tokyo, Japan including 5 nights of 4 star accommodation in a twin or double room on a bed and breakfast basis, return economy class flights from any capital Australian city and two tickets to World Cup of Rugby 2019, Pool D, Match 17 game on Sunday 29 September 2019 – Australia vs Wales. Transfers to and from Tokyo airport are included as part of the prize package. Elements of the prize (airfares, accommodation, transfers) are at the discretion of the Promoter. Total Major Prize Pool is valued at $15000.00. The prize does not include food and drink, travel insurance, personal expenditure and incidental costs other than those stated. It is the responsibility of the winner to ensure they have a valid passport and travel insurance and to obtain any necessary vaccinations and visas for the trip. 8. Minor Prize Draw. 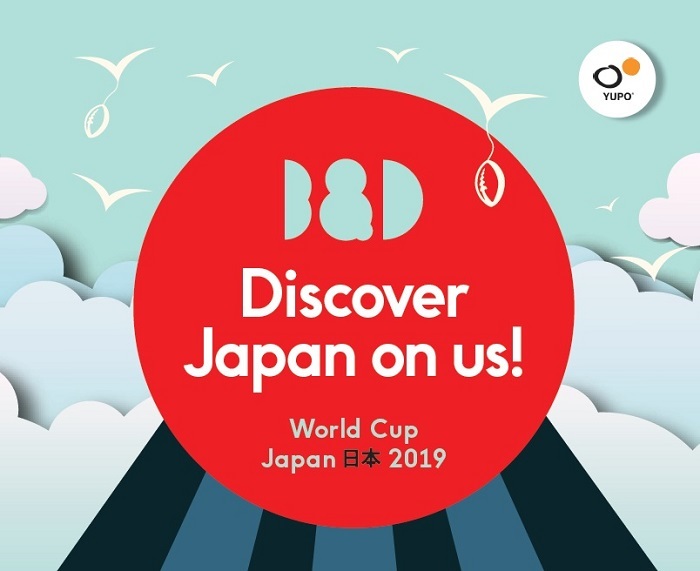 Every time you purchase a mill pack or a roll of Yupo product* from Ball & Doggett you will automatically be entered into a draw to win World Cup of Rugby 2019 merchandise. Each fortnight a lucky winner will be randomly drawn to win a set of 1 x Australian World Cup of Rugby Jersey, size XL, 1 x World Cup of Rugby ball and 1 x Australian supporter scarf. Therefor a total of 6 x World Cup of Rugby merchandise packs to be won over the campaign period. Minor Prize Packs are valued at $333.33. A random winner will be drawn each fortnight and contacted by phone or email. Winners name will also be published on the Ball & Doggett competition page of their website concluding each period. Draw dates as given 18th April for Draw 1, 3rd May for Draw 2, 17th May for Draw 3, 5th June for Draw 4, 19th June for Draw 5 and 5th July for Draw 6. The more packs you buy the more entries you get! 9. The promoter will not be liable for any loss or damage whatsoever (including but not limited to direct or consequential loss) or for personal injury suffered during the use of the prize. It is a condition of accepting the prize that the winner may be required to sign a legal release form determined by the Promoter in its absolute discretion. 10. Prizes are not transferable or exchangeable and cannot be taken as cash, it must be taken as offered and cannot vary. All elements of the prize are subject to availability. The prize is not transferable and cannot be redeemed for cash. 11. The winner agrees to the use of their name for publicity and promotional purposes, without compensation and agrees that the Promoter will own the copyright of any such images and video and in all material incorporating these photos and information. 12. Ball & Doggett collect the personal and demographic information you choose to provide us. We also collect information about how you use our websites and the areas of our sites you visit. We may also acquire information about you from third parties in order to further personalise your experience. The resulting logs contain information necessary for analysing the use of resources, troubleshooting problems and improving services. 13. Information collected through the entry process may be used in promotional activity. We may use your information to contact you about activities at Ball & Doggett. If you have consented for us to do so, we may use your information to contact you directly or through third parties about our products and services. We also share information where legally required. We may disclose and transfer information if our business is sold or acquired. 14. The personal information collected as part of the entry is collected to enable identification of the winner and for future marketing and promotional purposes. 15. It is the condition of entry that all rules are accepted as final and that the entrant agrees to abide by these conditions. The Promoter’s decision is final and no correspondence will be entered into. 16. In the event of the prize not being claimed, the winning entry will be deemed not to fulfil the entry requirements and the Promoter may, subject to relevant state authorities conduct further draws as are necessary to distribute the prize. Date of unclaimed prize draw is 9th August 2019. Time and place as the first draw. The winners name will be published on the www.ballanddoggett.com.au website by 12th August 2019 and notified by phone and email. 17. The Promoter reserves the right, at any time, to verify the validity of entries and entrants (including an entrants identity, age and place of residence) and to disqualify any entrant who submits an entry that is not in accordance with these terms and Conditions or who tampers with the entry process. Failure by the Promoter to enforce any of its rights at any stage does not constitute a waiver of those rights. 18. Website programming and other quality control errors will not invalidate an otherwise valid prize claim. 19. The Promoter is not responsible for any incorrect or inaccurate information or for any of the equipment or programming associated with or utilised in this competition, or for any technical error, or any combination thereof that may occur in the course of the administration of this competition including any omission, interruption, deletion, defect, delay in operation or transmission, communications line or telephone, mobile or satellite network failure, theft or destruction or unauthorised access to or alteration of entries. 20. The Promoter is Ball & Doggett, 6 Reconciliation Rise, Pemulwuy, NSW 2145, ABN: 580 051 900 36.